Small volumes of anti-NR0B2 antibody vial(s) may occasionally become entrapped in the seal of the product vial during shipment and storage. If necessary, briefly centrifuge the vial on a tabletop centrifuge to dislodge any liquid in the container`s cap. Certain products may require to ship with dry ice and additional dry ice fee may apply. The protein encoded by this gene is an unusual orphan receptor that contains a putative ligand-binding domain but lacks a conventional DNA-binding domain. The gene product is a member of the nuclear hormone receptor family, a group of transcription factors regulated by small hydrophobic hormones, a subset of which do not have known ligands and are referred to as orphan nuclear receptors. The protein has been shown to interact with retinoid and thyroid hormone receptors, inhibiting their ligand-dependent transcriptional activation. In addition, interaction with estrogen receptors has been demonstrated, leading to inhibition of function. Studies suggest that the protein represses nuclear hormone receptor-mediated transactivation via two separate steps: competition with coactivators and the direct effects of its transcriptional repressor function. Western blot analysis of extracts of various cell lines, using NR0B2 antibody at 1:1000 dilution. 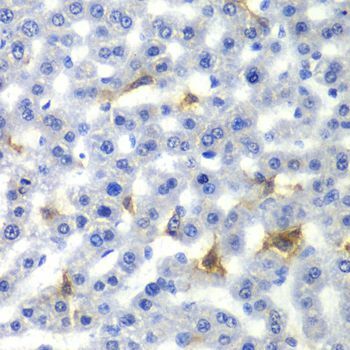 Immunohistochemistry of paraffin-embedded rat liver using NR0B2 antibody at dilution of 1:100 (40x lens). 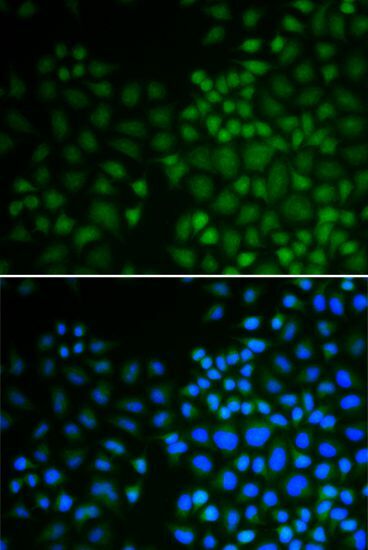 Immunofluorescence analysis of U2OS cells using NR0B2 antibody. Blue: DAPI for nuclear staining. NCBI/Uniprot data below describe general gene information for NR0B2. It may not necessarily be applicable to this product. NR0B2: Acts as a transcriptional regulator. Acts as a negative regulator of receptor-dependent signaling pathways. Specifically inhibits transactivation of the nuclear receptor with whom it interacts. Inhibits transcriptional activity of NEUROD1 on E-box- containing promoter by interfering with the coactivation function of the p300/CBP-mediated trancription complex for NEUROD1. 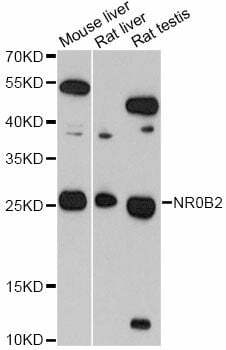 Defects in NR0B2 may be associated with obesity (OBESITY). It is a condition characterized by an increase of body weight beyond the limitation of skeletal and physical requirements, as the result of excessive accumulation of body fat. Belongs to the nuclear hormone receptor family. NR0 subfamily. 1. E2F1 transcription factor activates early growth response (Egr)-1 promoter which is repressed by SHP and EIA-like inhibitor of differentiation (EID)1.